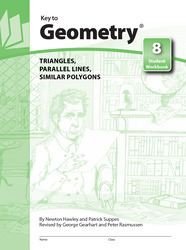 Key to Geometry introduces students to a wide range of geometric discoveries as they do step-by-step constructions. Using only a pencil, compass, and straightedge, students begin by drawing lines, bisecting angles, and reproducing segments. Later they do sophisticated constructions involving over a dozen steps. When they finish, students will have been introduced to 134 geometric terms and will be ready to tackle formal proofs.